TMD/TMJ Dysfunction - Pamela Morrison Pelvic Pain Physical Therapist, P.C. TMD/TMJ Dysfunction - Pamela Morrison Pelvic Pain Physical Therapist, P.C. 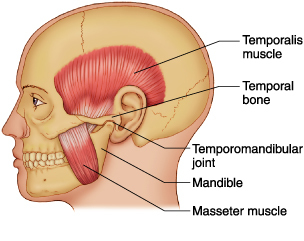 The temporomandibular joints are your jaw joints located under the ears on either side of your face. The joints connect your mandible to the temporal bones of the cranium or skull. The joints are small modified hinge joints that have a cartilage disc in the middle. Your jaw allows you to chew, talk, and perform activities that require jaw opening such as yawning. Dysfunction of the jaw is known as TMD or Temporomandibular Disorder. It was previously referred to as TMJ disorder/dysfunction. Causes of TMD include direct trauma or injury to the joint or face, bruxism or grinding/clenching the teeth, dental problems, or osteoarthritis. Stress can worsen symptoms. It is more common in women than men and usually effects people between the ages of 20 and 40 but we have also treated high school aged children. Symptoms include facial pain, headaches, ear pain, pain upon chewing or talking, neck and shoulder pain, audible click or popping in the joint, poor occlusion or ability to close the jaw, limited movement of the mandibles, the jaw becoming locked in a position, facial swelling, migraines, dizziness, pain or pressure behind the eyes, ringing in the ear (tinnitus), earaches, impaired hearing, and toothaches. Discoordination, asymmetry, or deviation of the mandible during movement may be present. Pain is usually worse on one side but dysfunction can be present on both sides. Medical treatment may include medications such as pain relievers, antidepressant, muscle relaxants, Botox injections, bite guards, braces, and surgery. Physical therapy is considered to be the best adjunct treatment. How can Pamela Morrison Physical Therapy, P.C. help TMD/TMJ Dysfunction? At Pamela Morrison Physical Therapy, P.C. we are orthopedic experts and have treated TMD for many years. We provide a comprehensive upper quarter exam which includes assessing posture and the mobility of the neck or cervical spine and thoracic spine, shoulder, cranial sutures, and jaw. We closely assess the mechanics of both temporomandibular joints externally and intraorally. We assess nerve function for the cranial nerves including the facial and trigeminal nerves. We test the muscles of facial expression and muscles of mastication (used for chewing) for pain, tender points, trigger points, spasm, length/flexibility, strength, and coordination. Treatment can include soft tissue mobilization, myofascial release, trigger point release techniques, joint mobilization, craniosacral therapy, therapeutic ultrasound, cold laser, prescriptive TMD exercises, postural education, TENS (transcutaneous electrical nerve stimulation), relaxation training, moist heat, integrative manual therapy, and neuromuscular re-education. Realigning the jaw, improving disc mechanics, resolving headaches and muscular pain, re-educating the intrinsic muscles of the jaw, and resuming painfree chewing are some of the treatment goals that we achieve. We work closely with your dentist for you to reach a painfree state and return to a normal functional status quickly.